What Year Is My Mini? When Was My Mini Built? What “Mark” Is My Mini? What Engine Is In My Mini? Select the Mini identification matrix that fits your needs. A step by step guide to Mini identification. Identify engines without ID plates. 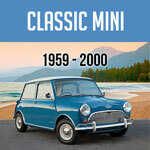 The following covers the most common Minis; i.e., those built in the UK. 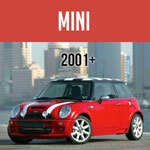 The ones built there for the UK market make up about 46% of the 5.3 million Minis built. You can be reasonably safe in extending the information in this article to Minis built in the UK for export sale, or those built in the UK as CKD (Completely Knocked Down kits) that were assembled in other countries. There are exceptions, but they are few enough. This accounts for another 46% of total Minis. So, figure 92% of all the Minis built were done in the UK. It is harder to extend the article’s discussions to cars built outside of the UK -- about 8% of the total. Some exceptions are noted in the article, but exercise caution when dealing with non-UK built cars. If you are new to Minis, you might want to work your way through the entire article. Follow all the links, or just take a section at a time. If you are not new to Minis, but haven’t been around them too long, you can use the various links to jump to sections that may interest you the most. And if you have been around Minis for years and see bits missing that you could add to Mini Identification, contact Mini Mania and offer to help fill in the blanks! (info@minimania.com) If you find errors pass that information on, too. If your Mini is in standard, factory form (i.e., “stock”) then sections like “Identifying Minis by Chassis Number/VIN – Standard Cars,”“Identifying Minis by Engine/Power Unit,”and the “Mini Mini History”will be helpful. Even if your car has been modified, the same sections should help with identification, depending upon the extent of modifications. If you go through parts of the identification sections and the history and something doesn’t add up, this article may still be helpful. Examples: your car seems to be a cross between a couple of types of Minis, or the Chassis Number/VIN plate is missing, or the engine ID plate is missing. There are a couple of sections that may help. See “Identifying Non Standard Minis,”and “Engine ID If the ID Tag Is Missing.”Both of these sections will work better if used with the sections on standard cars and engines.